The first downtown Vancouver office tower in more than 10 years will not be built at the site of General Motors Place. Back in 2008, Aquilini Group decided to postpone the project as it was unable to secure a long-term big tenant for the GM Place office tower during the biggest recession that we have seen in over 100 years. Now, in 2010, the Aquilini Group hopes to start construction on a new 22 storey GM Place Tower that will bring the first downtown Vancouver office building in almost a decade. Hoping to start construction this year, the Aquilini just announced plans for the first major office building in the area for a long time and sill sit adjacent to General Motors Place Stadium. The new GM Place Tower Vancouver office building should start construction in September 2010, according to Vancouver Sun and the Aquilini Group and will offer more than two hundred and thirty thousand square feet (230,000 sf) of prime downtown Vancouver office space for lease. David Negrin, the present of Aquilini Group Development and Construction also announced in early March, that the 22 storey Vancouver GM Place Tower office buiding will be designed by award winning architect Peter Busby, giving the high-rise a landmark design and façade. What’s unique about the new GM Place Tower Vancouver office building for lease is that it will be physically connected to General Motors Place Stadium, which is a first in this market. The office tower will start from the level of the Georgia Viaducts and the first three levels will be over height retail space. The main lobby entrance will be higher than ground level (at the viaduct level) from Expo Boulevard. Above the 3 retail floors, the downtown Vancouver GM Place Tower office building will present at least 19 more stories of prime office space. The Aquilini Group hopes that city council will approve additional floors, which should be permitted under the current height restrictions (as twenty two stories is well below the allowable height right now in this area). Just published in the Vancouver Sun on March 17, 2010 is an article that describes the newly planned and designed GM Place Tower Vancouver office building that will begin construction in the fall of 2010. Developed by the Aquilini Group and designed by Peter Busby, the 22-storey downtown Vancouver office building is a great project and the first office tower to be erected in the core in more than 10 years. Part of the unique design of the Vancouver office tower is that the GM Place Tower will be physically connected to General Motors Place Stadium with a few new entertainment options, restaurants/bars as well as the incorporation of some private stadium boxes connected to the stadium, which will be simply amazing. During the recession that took place between 2007 to 2009 (and even before then), most of the major Vancouver office building developers moved their attention to Burnaby, the suburbs and along the Broadway corridor, as downtown Vancouver real estate was way too expensive to build on. However, the Aquilini Group believes that the new Vancouver GM Place Tower office building comes at a great time when businesses and the downtown Vancouver office space market is on the rise. 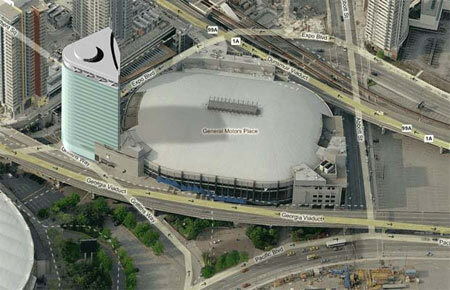 Originally, the Vancouver office tower at GM Place was proposed back in 2007, but was cancelled the next year. The indicators are strong for downtown office leasing market, and so many Vancouver office building developers are moving back into the downtown core. At the end of 2009, the downtown Vancouver office vacancy rate was around 5.8% (during the worst of the recession). However, early in 2010, indicators show that the downtown Vancouver office vacancy rate is again decreasing at an alarming rate, with a full recovering to come by the beginning of 2011. 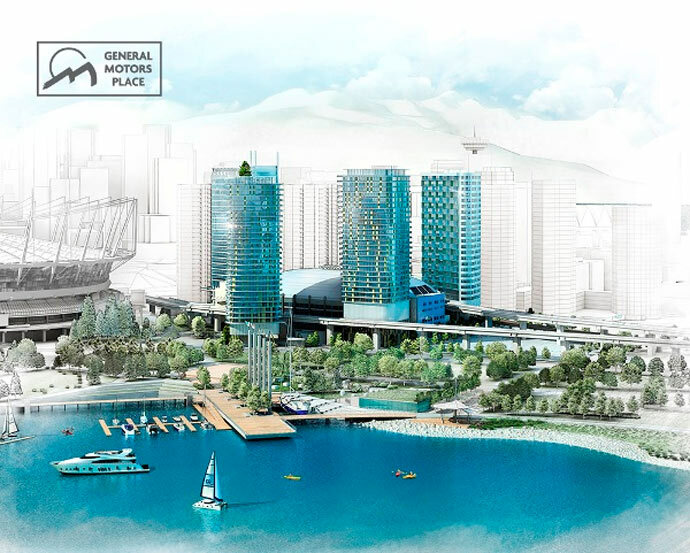 According to some experts, the recent advancements, developments and infrastructure projects around the North East False Creek Vancouver waterfront district have made great strides in the proposals and designs of major Vancouver office buildings such as GM Place Tower. The new Aquilini Group GM Place Tower Vancouver office building has considerable interest from major tenants already, and they hope to break ground September or October 2010. Before the announcement of the GM Place Tower office building by Aquilini Group, the last downtown Vancouver office tower erected was at Burrard and Dunsmuir at Bentall 5. Completed in 2 phases back in 2002 and 2007, the Vancouver Bentall 5 office building was the last major purpose built office tower in the downtown core since the GM Place Tower announcement in March 2010. Bentall Developers is also seeking to build another downtown Vancouver office wer (no information about location has been released yet), and it goes to the Permit Board of the City of Vancouver May 17, 2010, so stay tuned. In and around North East False Creek, where the downtown Vancouver GM Place Tower office building will be located, PavCo (British Columbia Pavilion Corporation) is also going to announce another commercial/office real estate development to the south west corner of BC Place Stadium. The Crown Corporation announced that they are in the final states of design, planning and proposal for a tenant to lease u rights to developer up to seven hundred thousand square feet (700,000 sf) of office space which will fund a large portion of the BC Place roof replacement project. All in all, the 22 storey GM Place Vancouver office tower will be a welcome addition to the downtown core. As more of the developers opted for residential development, there was a severe risk that the downtown area would lose commercial, office and retail space. The mixed-use nature of neighbourhoods is extremely important to a community, so the addition of the downtown Vancouver GM Place Tower is a good one for the long-term sustainability of North East False Creek. Just announced by the Aquilini Group, the new GM Place Vancouver Condo Towers will also be erected close to the office building but the release of new information and presales will not happen until 2011. What we do know, however, is that the master planned General Motors Place Condominiums and GM Place Vancouver condo towers will be a significant addition to the North East False Creek community. Likely, the Aquilini Group will add 4 stunning glass towers at GM Place Vancouver Condo development, that will surround the stadium. Close to restaurants, sporting events, shopping, Yaletown, SkyTrain and buses, the downtown Vancouver GM Place Condo Towers at General Motors Place will be a significant addition to the area and will likely complement the build out of Concord 2020’s 20 high-rise tower development along the waterfront of North East False Creek community. Stay tuned for more info about the new Vancouver GM Place Condo Towers.